Looking for an elegant appetizer salad this holiday season? This stunning dish has it all: seasonal appeal, unexpected savory twist on poached pears, delicious and make-ahead. 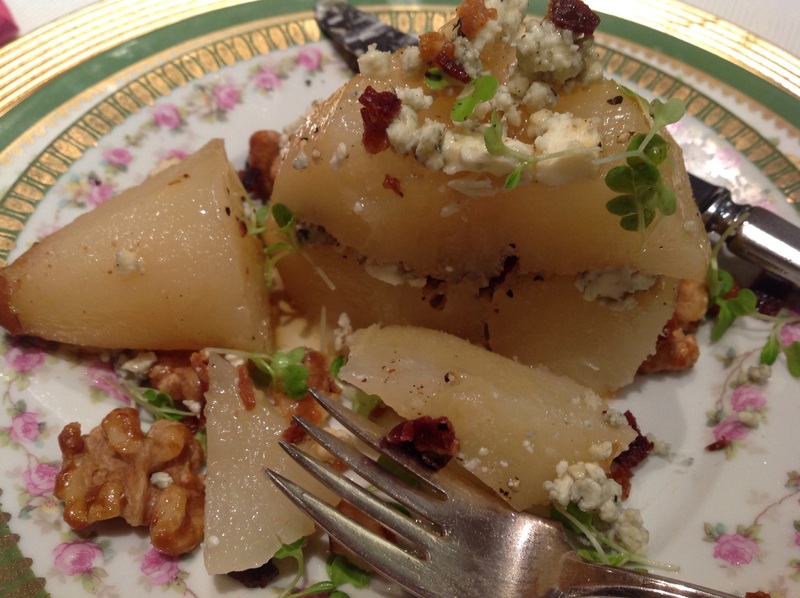 It is essentially a whole fragrant and lightly spiced poached pear, cut in thirds horizontally and reconstructed with layers of blue cheese, walnuts, bacon and micro greens. The pears can be poached in advance and the walnuts caramelized as much as a week ahead of time. The salad can be assembled in a few minutes at the time of serving. 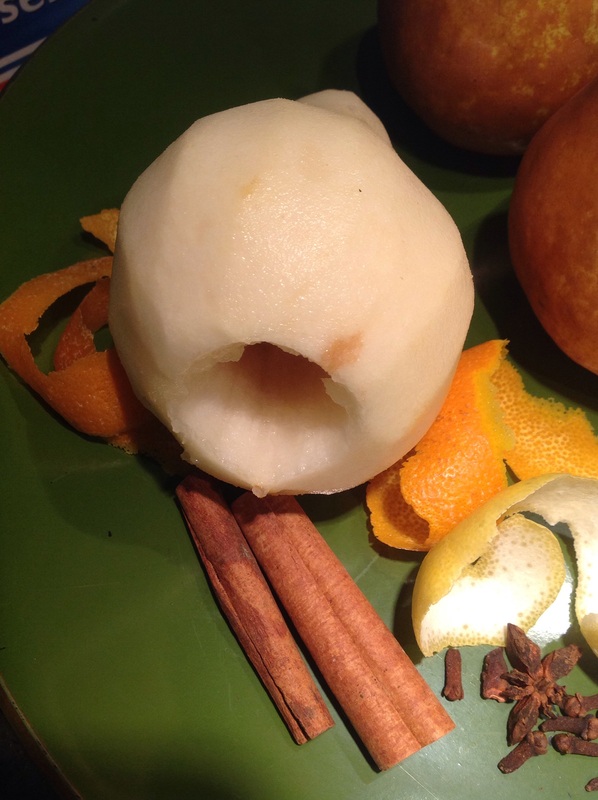 If you have not tried poaching pears, I hope I can convince you how easy they are. 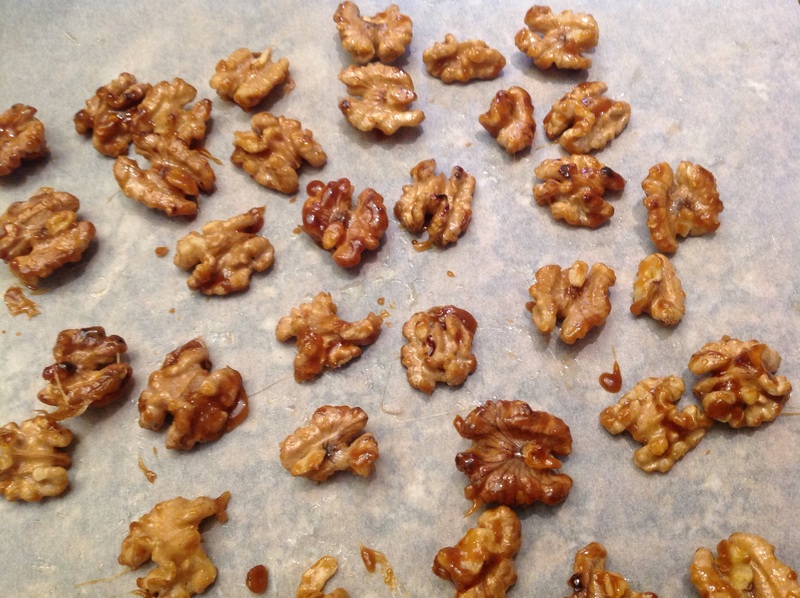 If pressed for time, you can purchase candied walnuts but this was my first attempt at making them myself and they took a mere 5 minutes. Their freshness is incomparable to the commercial version. These have a very light coating of the praline and a wonderful crunch. 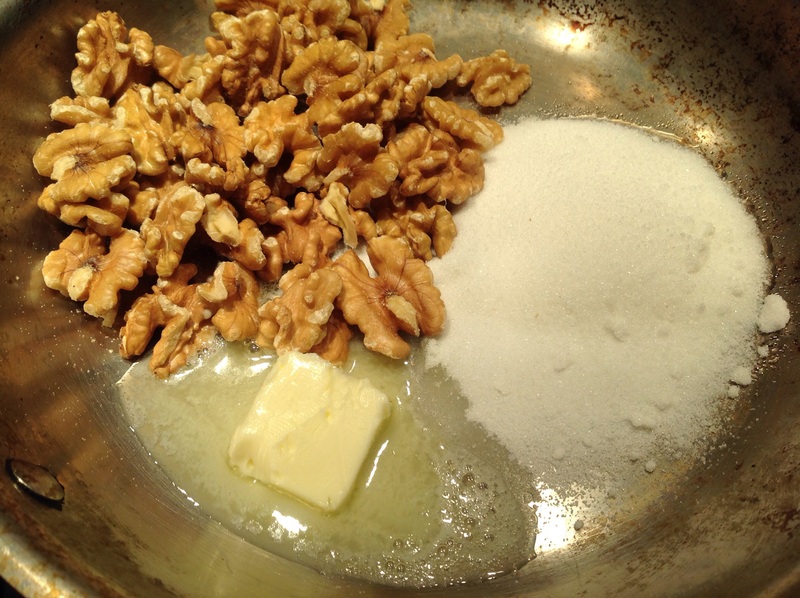 The nuttiness of the walnuts still shines and is not overpowered by the sugar. The recipe is for 4 pears but there is enough poaching liquid to make 8. Method: Peel the ripe but still firm pears, core them from the botttom and sit them upright in a deep but not too wide pot. Make sure to preserve their stems. 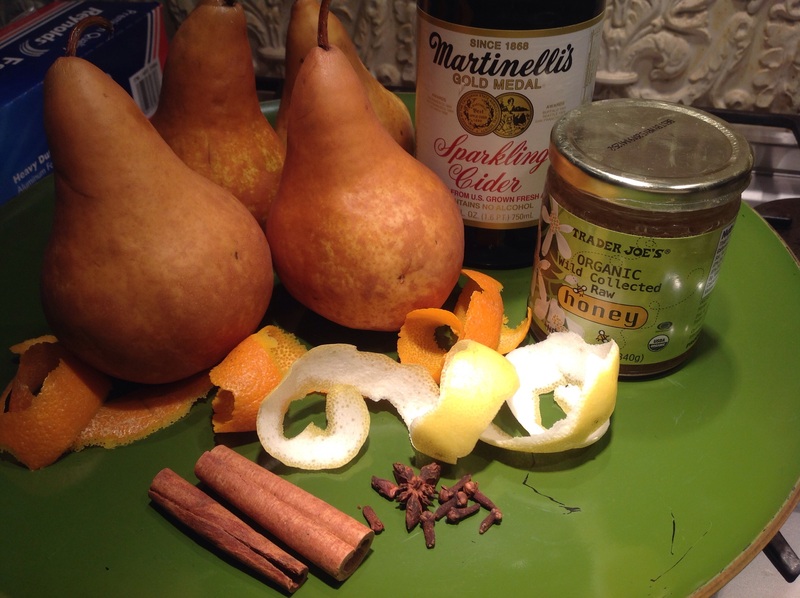 Cover them with the cider, the spices and honey and add enough water to cover the pears. Bring them to a boil, reduce the heat and simmer until tender but not falling apart, about 30 minutes. The pears will rise in the liquid a bit. Occasionally, immerse them in the liquid using a wooden spoon, so they cook evenly. Remove from the poaching liquid to cool. 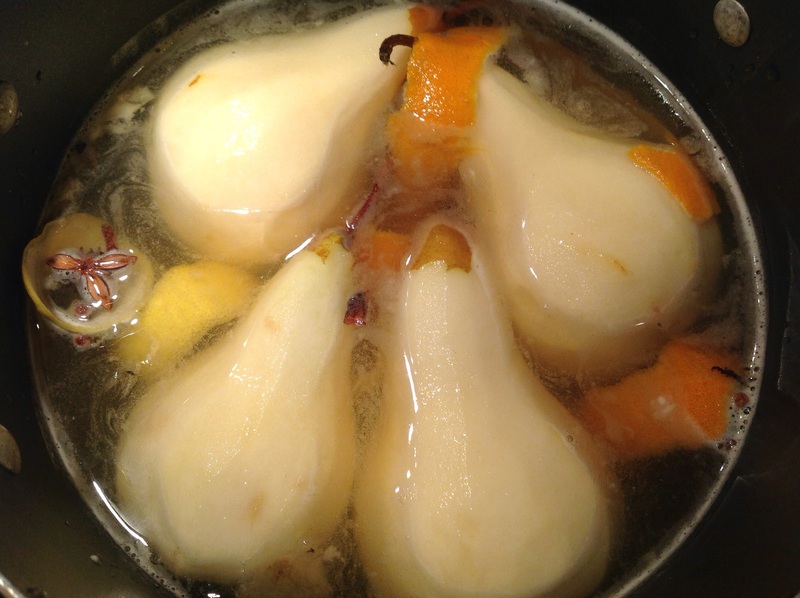 The poaching liquid can be saved for another batch of pears, up to a month in the refrigerator. Filter out the spices and peels if saving. Return 1 cup of the poaching liquid to the pot and bring to a boil and reduce at medium heat, stirring occasionally, until you have about 1/4 cup of syrup. Reserve until ready to assemble the salad. Heat a skillet over medium heat. 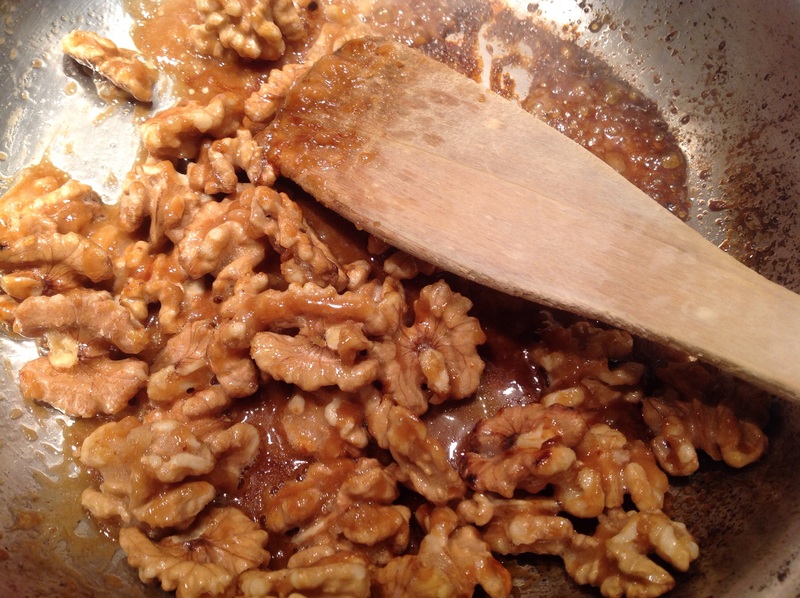 Add all the ingredients and stir continuously to coat the walnuts with the praline, about 3-5 minutes. Dump them over parchment paper, making sure they are separated. Cool and reserve. Try not to eat them! They are hard to resist! You will need 4 slices of crispy cooked bacon to crumble. Fresh ground black pepper. 4 oz crumbled blue cheese. Micro greens. 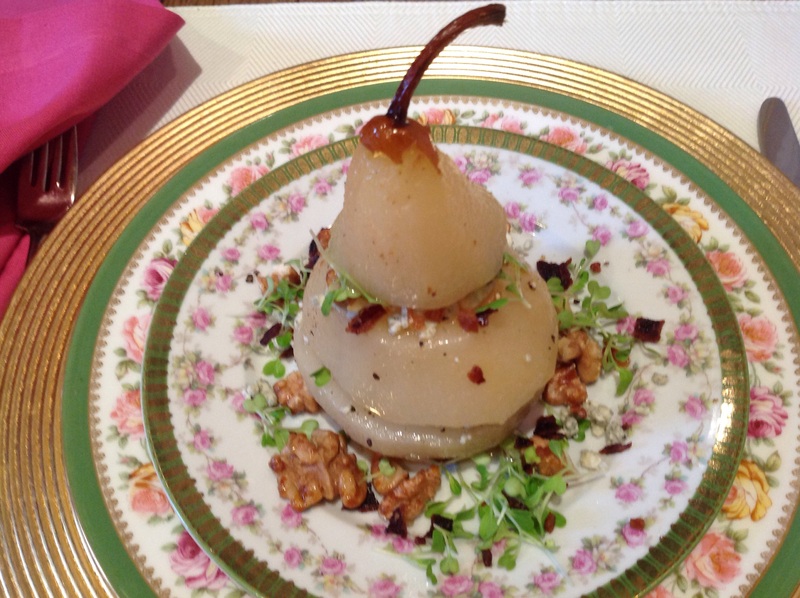 Your poached pears, the candied walnuts and poaching syrup. Cut each pear in 3, horizontally. Set the bottom segment on a salad plate. Sprinkle with about half the blue cheese, walnuts, bacon and micro greens and a turn of the pepper mill. (I broke the walnut halves in pieces). Place the next segment of the pear on top of the first and repeat. 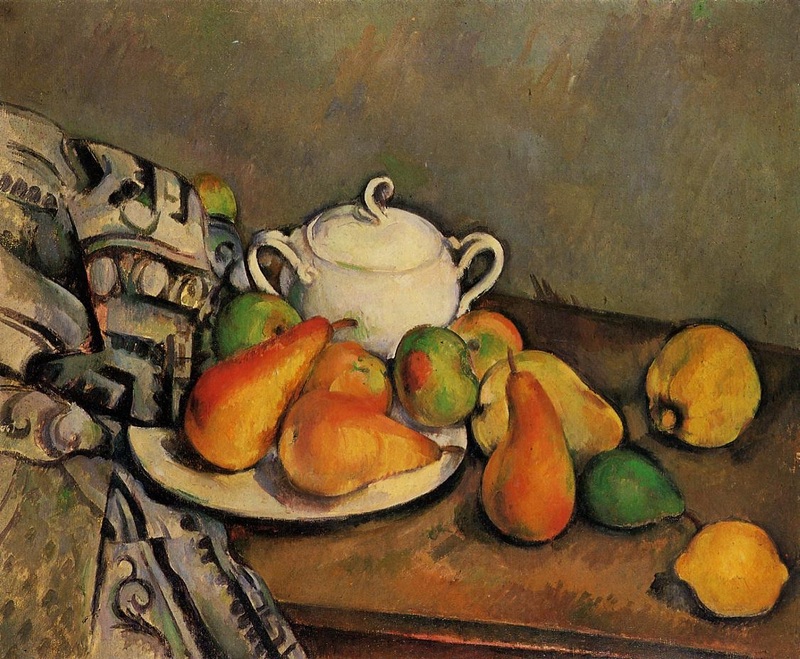 Top with the stemmed segment of the pear. Scatter any left over blue cheese, bacon, walnuts and greens around the pear. Spoon a tablespoon of the reserved syrup over the top of the pear and serve. This may seem like a labor intensive recipe but I assure you it only looks that way. 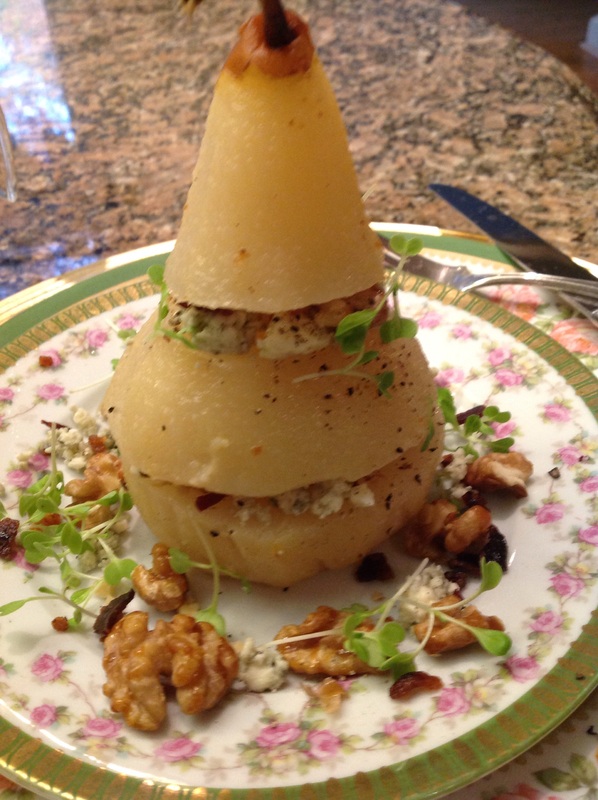 The final creation is a stunning reconstructed pear salad sure to wow your guests. Your own little culinary masterpiece! This entry was posted in Entertaining, Recipes and tagged blue cheese walnut and bacon poached pear salad, caramelized walnuts, Christmas salad, Easy candied walnuts, easy caramelized walnut, pralined walnuts, Reconstructed poached pear salad, spice poached pears, Thanksgiving starter, vanilla bean and honey poched pears by Johanne Lamarche. Bookmark the permalink. Oh my goodness Johanne — this looks soooo yummy! I CANNOT wait to try it — and what a great idea for a dinner party! As a matter of fact, I was looking for an elegant by light appetizer for a dinner I am giving in a few days, and this fits the bill perfectly. I have poached pears for desserts before, but never a dish like this. Thanks a bunch! You’re welcome Hilda! I always have done poached pears for dessert too. Let me know how they turn out. The addition of the bacon really makes this recipe super intriguing. Bacon makes EVERYTHING better ( I wish they’d make bacon-flavored toothpaste! ), so I can only imagine how great it tastes with the sweetness of the pairs and bite of the blue cheese. Mmmm!!!!! The bacon was an after thought….i felt the pears were too sweet to call a salad until the bacon was added! Bacon does make everything taste better! 🙂 19 degrees here today Brrrr! lovin the savoury touch of bacon on pear dessert…. I’ve done pears in red wine too and they get such a gorgeous color! They could work in this salad too! Beautiful presentation and it looks SO good! Thank you Nancy! I really loved this creation. Thank you for stopping by! Thank you so much! It does look good enough for a fancy dinner party but delicious enough for everyday too. Thanks for stopping by! Poached pear salad?! Where has this been all of my life?! I love poached pears for dessert, but I’ve never thought of making them into a salad. And with blue cheese and caramelized walnuts AND bacon? Be still my beating heart! Exactly my thoughts too Tracy! 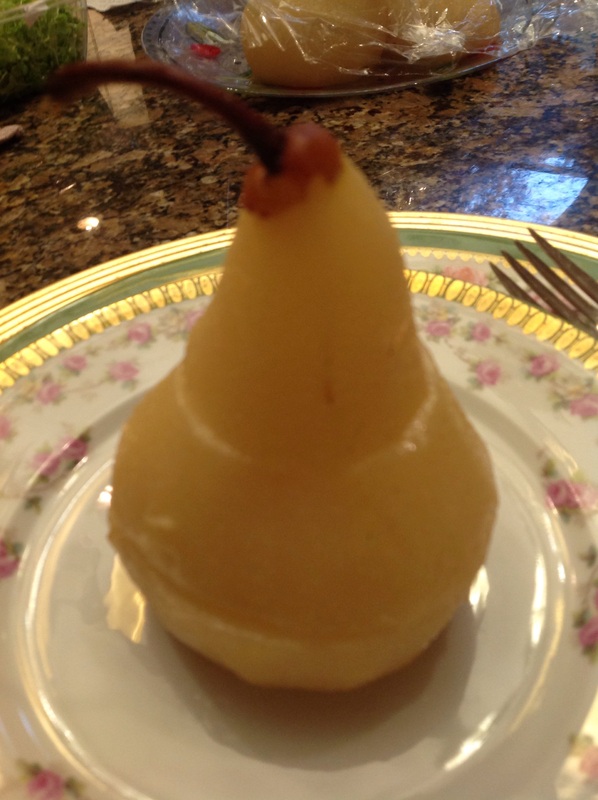 I had only made poached pears for dessert in the past too. They make a fantastic salad! I hope you’ll try them too. 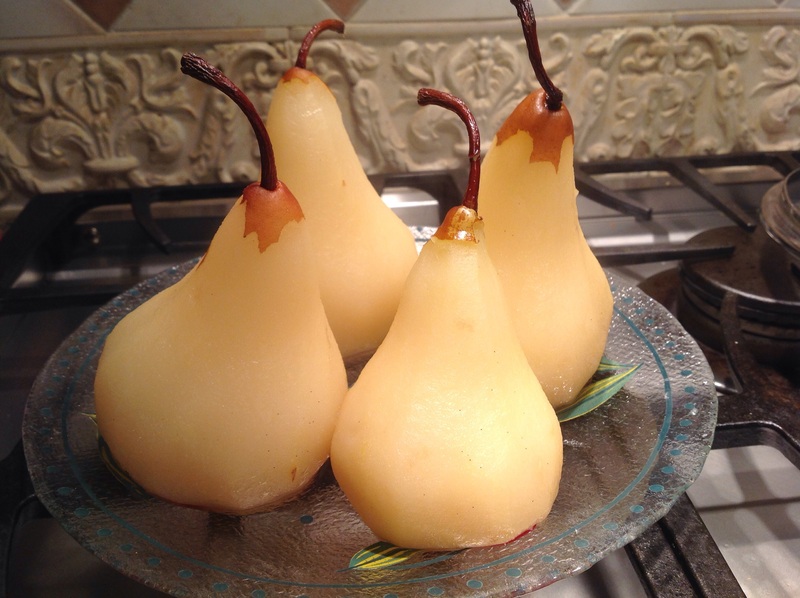 \i haven’t had poached pears in years – the idea with the salad is ingenious! Same here Ginger. I go through phases with poached pears. This was a delicious adaptation! Happy FF! Thank you Juliana! I enjoyed creating this one. Happy FF and Thanksgiving! It is for recipes like this, that I always stock bleu cheese, bacon and nuts in my fridge! But I’ve never thought to poach the pears, yum! What a beautiful dish. I love all of your flavors. Thank you Julie! Thank you for stopping by. It’s always nice to hear from you. Oh my, what a fabulous salad–love the elegant presentation! I saw this on fiesta friday and had to stop over and check it out and add my follow! Wow, this looks incredible! 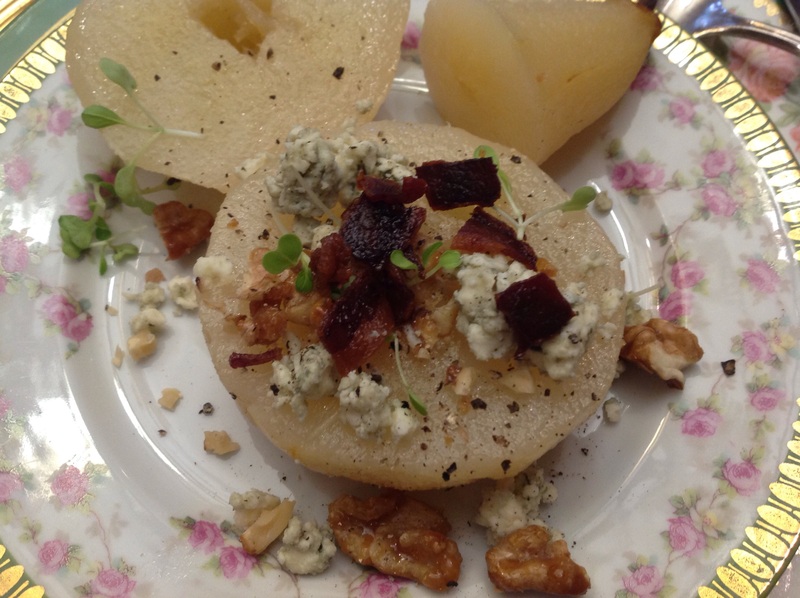 I love the combination of bleu cheese and pears, and what a fantastic presentation! I wish I had more than two pears sitting on my table right now! Thank you so much for your enthusiastic comment and for following me! Several people reported they mad ethis very easy dish for Tahnksgiving yesterday and it was a big hit! I’m so glad you let me know! My German speaking son is home from college and he loves your blog name! This is gorgeous! How do you think it would work without the bacon for the vegetarians? I’m thinking the blue cheese might give it enough savory (especially if I don’t tell anyone I left it out)? I think it would be fine without the bacon! Just choose a pungent blue cheese and it will be great. Enjoy and thank you so much for reading!